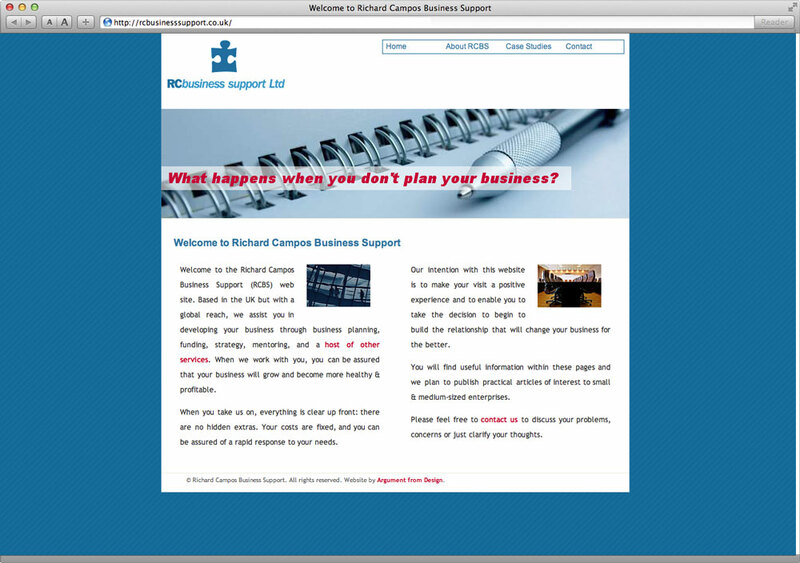 needed to have an attractive website which emphasised planning & the ‘bustle’ of business without hitting the visitor over the head: this reflects their own corporate ethos, which is to guide companies without forcing them along a path. ardes emphasised planning by the use of appropriate photography: oblique images reflecting business needs & goals, but photos which were missing a figure to give a guiding hand. Ringbinders with pens, a man in a maze, people hurrying along a hallway, a diagram of a “game plan”—all suggest actions, but ones which need missing guidance, which RCBS can provide. Finally, set the site’s navigation so that the client’s content was easily accessible at all times. For the first goal, ardes used a pinstripe background: a classic telltale symbol of serious business and a method of suggesting the purpose of the site in a subtle way. This is indicative of our approach to design: we use elements to help enhance—often at a sub-conscious level—the goals of the organisation. The website’s layout is based on a strong grid, repeated throughout the site in order to help the visitor predict the location of the content she’s looking for if she’s in a particular hurry. In this context this is very important: companies in deep trouble often have their staff working flat-out & if they’re looking for help, you won’t have a second chance to regain their attention: it’s therefore in the client’s best interests to keep to a strict layout. For those who aren’t in such dire predicaments, they can find the layout clear, calm & thoughtful. Keeping the content easily accessible at all times reinforces the client’s second goal—to make the site intuitively laid-out—but, but this can lead to an extraordinarily busy site with far too much information on it. Accordingly, Argument from >Design created a drop-down menu system, easily legible by search engines (a rarely-achieved goal) & easily read by screen readers for the blind—an important accessibility goal if your clients include government-funded bodies.